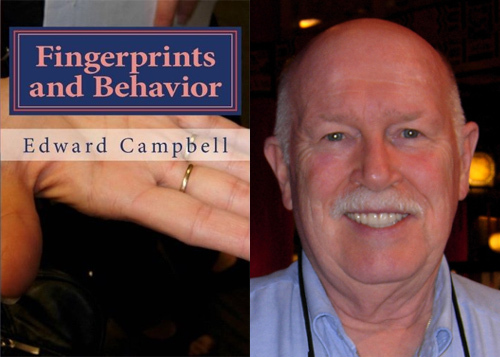 Expert hand Analyst Edward D. Campbell has now introduced his second book titled: 'Fingerprints and Behavior' (2012). This 282 pages paperback presents well illustrated and referenced materials - representing an ambition to become the new primer in the fields of modern hand reading & palmistry! Ed Campbell became known as e.g. the author of the book 'The Encyclopedia of Palmistry' (1997), and he is the initiator & chairman of the International Behavioral & Medical Biometrics Society (IBMBS). 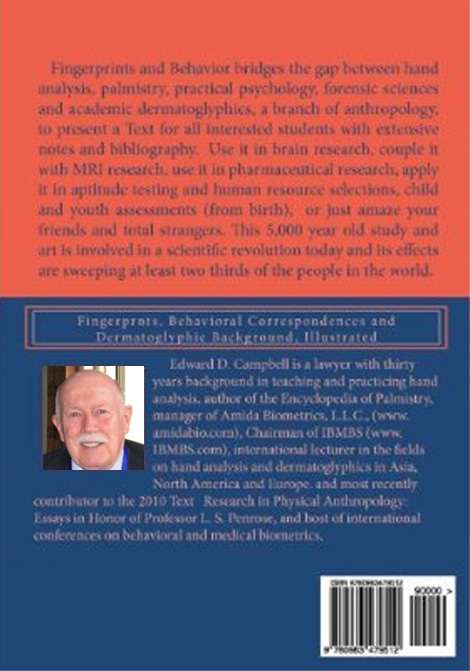 "Fingerprints and Behavior bridges the gap between hand analysis, palmistry, practical psychology, forensic sciences and academic dermatoglyphics, a branch of anthropology, to present a Text for all interested students with extensive notes and bibliography. Use it in brain research, couple it with MRI research, use it in pharmaceutical research, apply it in aptitude testing and human resource selections, child and youth assessments (from birth), or just amaze your friends and total strangers. This 5,000 year old study and art is involved in a scientific revolution today and its effects are sweeping at least two thirds of the people in the world." • BOOK: 'Fingerprints and Behavior' by Ed Campbell! • Fujitsu gives biometrics a hand! • More fingerprint news & reports!